It can happen to the best of us. We wait until we’re scrambling and then have to make last-minute Valentine’s plans. Or… one Sweetheart expects something more than is planned; one Sweetheart hasn’t planned anything at all, or the plans that have been made fail miserably. Any of these scenarios can result in a whole lot of not-love going around. Here is some advice from the Wise Guys & Gals to keep these scenarios from happening this evening (or Saturday) with YOUR Sweetheart… even if you are reading this and making last-minute Valentine’s plans. 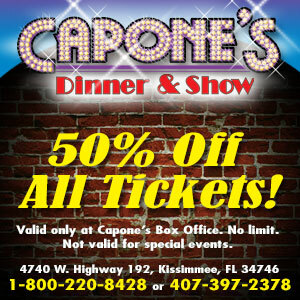 Plain and simple last-minute Valentine’s plans… take your “Gal” or “Goon” to a dinner show at Capone’s tonight! 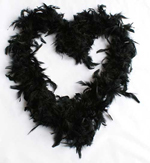 There are still a few tickets available for tonight’s Capone’s Valentine’s Show. The early show option is extremely limited, however, tickets are readily available for the late show (8:30 pm). Either way, it will seem as if you’ve planned this evening for weeks! Purchase tickets online, pick up your date and show up for the show! Or, purchase tickets, call a cab or Uber and arrive at the show ready to enjoy the unlimited drinks included in your show ticket. Tickets are only $34.99 adults and $22.99 kids (plus tax and gratuity). There still may be a limited number of VIP Tickets available at $46.99 adults and $31.99 kids (plus tax and gratuity). However, since you’ve waited until now (like a true flat tire) and are making last-minute Valentine’s plans, don’t count on those VIP tickets. Saturday has Two (2) Shows too! With V-day being on a weekday, perhaps you’re planning to celebrate your love this weekend instead of tonight. Capone’s has you covered there too! This Saturday, February 18, there are also two show times available (5 pm and 8:30 pm). Tickets are available for both of these shows…at least for now. Even though it’s not really, really last-minute Valentine’s plans, attending the show on Saturday gives you a few more days to make it extra special. HINT: Spring for some roses or jewelry to go along with the dinner show tickets! Pre-order a boa &/or a fedora and get into the spirit & have fun! The gang hopes everyone will join them and have a great Valentine’s day today. If not, Al hopes you have a really, really good alibi! 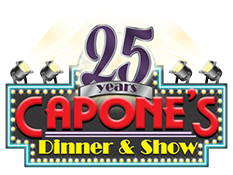 Celebrate Valentine’s at Capone’s Dinner & Show. Reservations at some Orlando restaurants are difficult to get on this sweetheart holiday. Movie theaters are packed on any evening, but Valentine’s can be even busier. For these reasons, and many more, you’d best have your plans in order, and your plans should definitely include Capone’s! Wednesday, February 14th – 2 shows – 5:00 p.m. & 8:30 p.m.
gangster shoot out – with an opportunity to win prizes! Capone’s has been celebrating Valentine’s Day for 25 years, entertaining guests of all ages. The ability to appeal to such a wide range of ages is one of the reasons for this Orlando dinner show’s success. Another reason is the entertainment value. The show is funny, action-packed and has just enough romance to top off your Valentine’s experience. The food quality has dramatically improved over the years and the menu now features many homemade dishes, including fresh homemade pasta! A new meat carving station and fresh salad bar ensure there is something for everyone, even the kids. Add to this the unlimited beverage selection, which includes over 15 choices; beer and wine too! Regular rates for this Orlando dinner show are $69.99 for adults and $45.99 for children (ages 4-12) and free for children 3 and under. However, you can mention the internet special when calling in your reservation and receive 50% off or purchase your tickets online and get them at half price. Your ticket purchase covers everything except gratuity! Where else can you go on Valentine’s Day weekend and only spend $34.99/adult and $22.99/child and get all of this? Capone’s Dinner & Show also offers costume accessories to help get into the era and spirit. Purchase a boa for the lady and a fedora for the gent, and you have instant participation without a lot of hassle! Be sure to order your dress-the-part costumes at the time you make your reservations and save 10% by entering the promotional code “Outfit” when checking out. 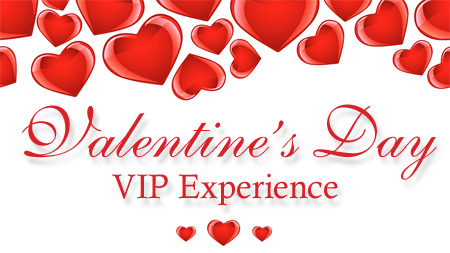 If you still need to make last-minute Valentine’s plans, just go to AlCapones.com and make reservations or order VIP tickets and relax. You’re going to have a great time. Your special someone is really going to enjoy the show, and you’ll come away smelling like…well, a dozen roses! Please Note: The roses are YOUR responsibility…Al don’t want nothin’ to do wit’ dat. *There are a few restrictions concerning young children in the VIP section, so please call if you need clarification.